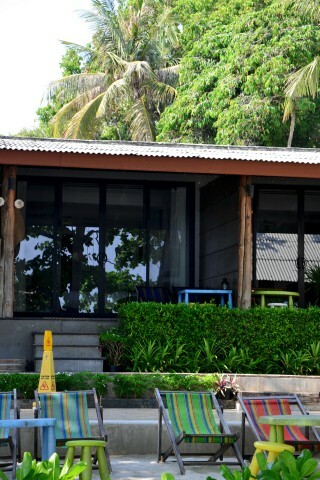 Squeezed between two of Samet’s biggest resorts, Summerday is a more stylish and personable place to stay on a beach where most places lack personality. It makes up for the lack of a swimming pool with multiple hammocks, loungers and a bar looking straight towards the sea. Set in an attached single-floor building, the six rooms feature brick walls painted white, framed black-and-white photography, comfy beds and sofas, bright impressionist-inspired lampshades, spacious polished concrete bathrooms with wood toilet seats and wall-size glass doors opening onto private balconies fronting the beach. Rooms are immaculate. You could watch the sunrise from bed, though it might be best to keep the curtains drawn for privacy. There’s also a family room occupying a corner of the property. All rooms are equipped with WiFi, TVs, safes, fridges and wood basins for washing the sand off your feet. The resort was built around a tall umbrella tree that provides shade for the loungers and tables set up over the sand. The restaurant, bar and staff all have excellent reputations. The receptionist who greeted us was welcoming in what felt like an authentic way. Yes, the rooms are great, but it’s the unpretentious attitude that makes Summerday an excellent alternative to Haad Sai Kaew’s larger resorts. Summerday often books up for weeks at a time in high season -- reservations are essential. If you’re looking for an alternative on Haad Sai Kaew with similar rates, you could do worse than the nearby Tonsak Resort.